The premise of tonight's show is simple enough, four men from established punk rock bands performing acoustic sets and touring Europe with it. Jon Gaunt violin kicks off alongside Joe Ginsberg's upright bass, both of whom being guests on this tour to accompany each of the acts, the virtuosity in both men is prevalent throughout the rest of the show, adding a fresh new touch to each song. The four men grace the stage. Dave Hause from The Loved Ones, Chuck Ragan, formerly of Hot Water Music now performing as a solo artist, Dan Andriano, bass player for punk legends Alkaline Trio and finally Brian Fallon from The Gaslight Anthem. The set up is unorthodox with no percussion onstage besides a tambourine and a few shakers alongside four acoustic guitars. Dave Hause, being the new face for most people here tonight, charismatically glides across the stage performing a mix of his solo songs as well as songs from previous band The Loved Ones. Hause's voice reverberates through Rock City alongside a small portion of the crowd singing along. His songs are so infectiously catchy that it feels that by the end of his set, they've been imprinted in your mind for a good while. Veteran of the punk rock scene, Chuck Ragan, opts out of a segment of his set to allow Huddersfield native Jimmy Islip to take the stage. Having released a four way split EP with Ragan earlier this year, Islip performs his song "1990" from that as well as a cheery rendition of The Pogues "Dirty Old Town". When Ragan returns to grace the stage, he focuses more on his current solo material rather than covering Hot Water Music songs, performing songs from his recent effort "Covering Ground" to much acclaim. Alkaline Trio's Dan Andriano is surprisingly charismatic and is a comedian in his own right (new career path maybe? ), staying true to his roots by even as going so far to take a request from one fan for "Enjoy Your Day" from 1999's "Goddamnit". Dan truly showcases the high points of this tour. Focusing heavily on material from 2003's "Good Mourning" as well as material from his recent solo effort "Hurricane Season". Releasing his side-projects album earlier this month, Brian Fallon takes the stage with fellow Horrible Crowes member, Ian Perkins, and performs a choice selection of songs from their recent effort "Elsie" including personal highlight, "Crush". Despite a slight hiccup of Fallon having to tell a few members of the crowd to shut up in the politest way he possibly could, he keeps his cool and remains a hero throughout, telling stories about The Gaslight Anthem's new album in between songs. It's quite amazing how one tour could round up so much talent and package it together on one bill. 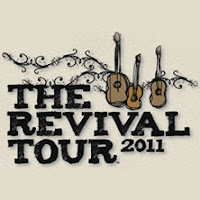 The Revival Tour shows a positive light of touring the world and the relationship between each artist and the audience by removing the pedestal that the audience members may place bands on.